You are currently browsing posts tagged with M.I.A. A few months ago, model/indie darling Agyness Deyn–who can pull off fug clothes–was photographed in a memorable Henry Holland dress that made her look as though she were on her way to entertain at a children’s birthday party before snorting rails with Boy George, having a colorful breakdown, and then checking herself into a mental institution. 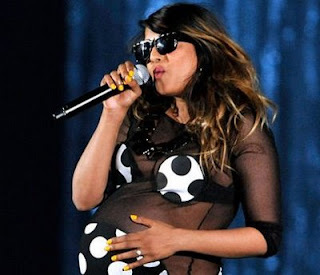 Last night, a 9 months-pregnant M.I.A. performed at the Grammys with Jay-Z, Kanye, T.I., and Lil Wayne in the same dress. While some are hating on the garment–as though a model out on the town was still wearing it rather than an artist about to pop–I think it could quite possibly be the bitchin’est maternity dress I’ve ever seen. Further proof that Asian ladies are the hottest, baddest, hardest muthafuckin’ women on Earth: M.I.A. announced that she will perform at the Grammys on Sunday, THE DAY HER BABY IS DUE. Either contractions actually aren’t that bad, or M.I.A. really is Hardass as nails–regardless, color us impressed. 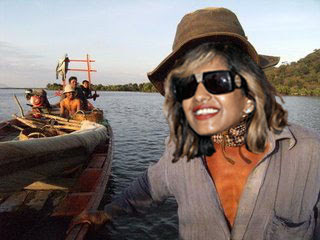 The “retired” M.I.A. played a show in Brooklyn over the weekend, where it was revealed that the singer is pregnant. Are we bad people for being insanely jealous of an unborn fetus? Because we already hate the kid for being so dope, hot, musically-inclined, and rich. Oh, Y.O.U. Such a K.I.D.D.E.R.